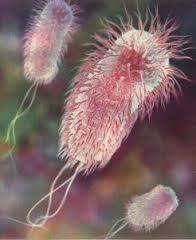 Escherichia coli (E. coli) are Gram-negative rods, non-spore forming bacilli. They are approximately 0.5µm in diameter and 1.0-3.0 µm in length. They are commonly motile in liquid medium by means of peritrichous flagella, are commonly fimbriated and are facultative anaerobes. When grown fermentatively on glucose or other carbohydrates, they produce acid and gas (H2 and CO2). By traditional clinical laboratory tests, E. coli is positive for indole production, and methyl red tests. Most strains are also oxidase, citrate, urease, and hydrogen sulphide negative (Sousa, 2006). E. coli is one of the predominant facultative, anaerobic microbiota of the human colon, which contains up to 1014 bacterial cells, comprising of an estimated 400 species of microorganisms (Nutrition and Health Collection, 2003). The organism typically colonizes the gastrointestinal tract (GIT) of infants of most warm-blooded animals within hours or days after birth, and thereafter proceeds to live a symbiotic existence with the host, where it remains harmless and confined to the intestinal lumen. However, in immunocompromised or immunosuopressed hosts, even ‘normal and non-pathogenic’ strains of E. coli can cause infection. Even the several highly adapted E.coli clones have acquired ability to adapt to new niches and this allows them to cause broad spectrum of diseases. These virulence attributes are frequently encoded in genetic elements that can be mobilized into different strains to create novel combination of virulence factors. These genetic elements, which once might have been mobile, have now evolved to become locked into the genome (Kaperet al, 2004). Three general clinical syndromes can result from infection with any of these resultant pathotypes of E. coli: enteric/diarrhoeal diseases, urinary tract infections (UTIs), and sepsis/meningitis. The various pathotypes of E. coli tend to be clonal groups, characterised by shared lipopolysaccharide (LPS) and flagella that define serogroups or serotypes (Nataro and Kaper, 1998). Several E. coli pathotypes have been implicated with diarrhoeal illness, a major public health problem worldwide with over two million deaths annually (Kosek et al., 2003). It is most commonly associated with endemic form of childhood diarrhoea in developing countries (Huilan et al., 1991). Furthermore, some of the diarrhoeagenic E. coli are also increasingly being recognised as important enteropathogens in developed countries (Cohen et al., 2005). At least six categories of diarrhoeagenic E. coli have been described, and they include: enteropathogenic E. coli (EPEC), enterotoxigenic E. coli (ETEC), enteroinvasive E. coli (EIEC), enterohaemorrhagoc E. coli (EHEC), enteroaggregative E. coli (EAEC) and diffusely-adherent E. coli (DAEC) (Nataro and Kapler, 1998). Two additional categories, cell-detaching E. coli (CDEC) (Gunzburg, 1993) and cytolethal distending toxin-producing E. coli (CLDTEC) (Johnson and Lior, 1988) were also proposed. The classification of these pathotypes is based on the presence of different chromosomal or plasmid-encoded virulence genes in E. coli enteropathogens that are absent in most commensal strains, as well as their pattern of interaction with epithelial cells and tissue culture monolayer (Nataro and Kapler, 1998). Each of these groups has different serotypes and each of them possesses different characteristic features that distinguish them from each other. EPEC was the first pathotype of E. coli to be described. Although large outbreaks of infant diarrhoea due to EPEC have almost entirely disappeared from developed countries, EPEC remains an important potential cause of infant diarrhoea in developing countries (Nataro and Kapler, 1998). The hallmark of infections due to EPEC is the attaching-and-effacing (A/E) histopatology, which can be observed in intestinal biopsy specimen from patients or infected animals, and can be reproduced in cell culture (Ushlen and Rollo, 1980). This striking phenotype is characterised by effecement of microvilli and intimate adherence between bacterium and the epithelial cell membrane. Marked cytoskeletal changes, including accumulation of polymerised actin, are seen directly beneath the adherent bacteria. The bacterium sometimes appears to sit ipon a pedestal-like structure. These pedestals structures can extend up to 10µm out from the epithelial cell in pseudopod-like form (Moon et al., 1983). The most notable feature of epidemiology of the disease due to EPEC is the striking age distribution seen in persons infected with the pathogen; EPEC is primarily a disease of infants younger than two years. Among the six recognised diarrhoeagenic E. coli, ETEC is the most common, especially in the developed world (WHO, 1999). ETEC causes watery diarrhoea, which can range from a mild, self-limiting disease to a severe, purging one. The organism is an important cause of childhood diarrhoea in the developing world and the main cause of diarrhoea in travellers to the developing countries (Nataro and Kapler, 1998). ETEC strains are major causes of secretory diarrhoea in both human and animals (Bern et al., 1992). ETEC colonises the surface of the small bowel mucosa and produces toxins, which give rise to intestinal secretion. Colonisation is mediated by one or more proteinaceous fimbrial colonisation factors (CFs), which are designated by CFA (colonisation factor antigen), CSA (coli surface antigen) or PCT (putative colonisation factor) followed by a number. EIEC causes broad spectrum of human diseases. They are biochemically, genetically and pathogenically closely related to Shigella species. Both characteristically cause invasive inflammatory colitis, but either may also elicit a watery diarrhoea syndrome similar to that caused by other E. coli pathotypes. The pathogenesis of disease caused by EIEC and Shigella invloves a cellular invasion and spread, and this requires specific chromosomal and plasmid-borne virulence genes (Nataro and Kaper, 1998). EIEC causes invasive inflammatory colitis and dysentary with clinical presentations (blood and mucus-filled stools accompanied by fever and severe cramps) identical to the disease caused by Shigella species. EIEC/Shigella invades intestinal epithelium principally in the large intestine. Once inside the cells, they lyse the phagocytic vesicles and replicate freely in the cytoplasm of the host cell. EIEC/Shigella rarely invades the blood stream, but they do invade the lamina propia immediately under the intestinal epithelium where interaction with macrophages causes the release of pro-inflammatory mediators and even induction of apoptosis. EAEC strains are defined by their distinctive pattern in Hep-2 cell culture (Nataro and Kaper, 1998). This organism can display a wide array of virulence factors (Sousa and Dubreil, 2001). EAEC is a pathogen associated with persistent diarrhoea in the developing world and has been implicated recently as the causes of outbreaks and sporadic diarrhoea among AIDS patient (Sousa, 2006). EHEC is the most important recently emerged group of foodborne pathogen among diarrhoeagenic E. coli (Mora et al., 2005). The term ‘enterohaemorrhagic’ was originally coined to denote strains causing haemolytic colitis (HC) and haemolytic uremic syndrome (HUS), which produce lessions in epithelial cells and possess a 60mDa plasmid (Levine and Edelman, 1984; Levine et al., 1987). The names shigatoxin E.coli (STEC) and verocytotoxin E. coli (VTEC) are equivalent terms, and both refer to E. coli strains which produce one or more toxins similar in structure and biological activity to shiga toxin (Stx), produced exclusively by Shigella dysenteriae type 1 (O’Brien et al., 1982), and the best known and harmful Shigella toxin (Craig and Murray, 2001). Thus, EHEC denotes a subset of STEC and includes a clinical connotation that is not implied with STEC (Nataro and Kaper, 1998). Whereas not all STEC strains are believed to be pathogenic, all EHEC strains by the above definition are considered pathogenic. Man and Microbe is a magazine published by Nigerian Association of Microbiology Students (NAMS), University of Ado-Ekiti Chapter, Nigeria.